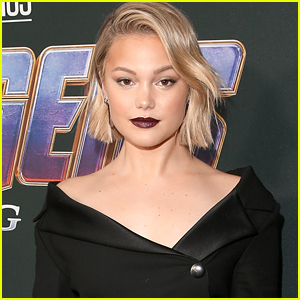 Josh Montgomery Photos, News, and Videos | Just Jared Jr. 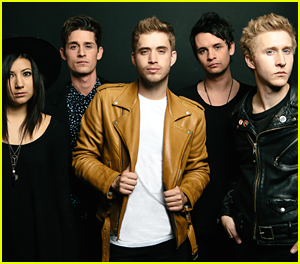 The Summer Set Debut New Album 'Stories For Monday'; Drop 'Wasted' Video - Watch! It’s safe to say that all JJJ will be listening to until the end of time is The Summer Set‘s new album, Stories For Monday. The band — Brian Dales, Jess Bowen, Stephen Gomez, John Gomez, and Josh Montgomery — dropped the album at midnight tonight (April 1) and it’s amazing! “I almost gave up on music last year. Then I wrote this song ['Figure Me Out']. It’s funny how the most important ones come to you when you least expect it,” Brian shared about the lead single. Full song list: “Figure Me Out”, “The Night Is Young”, “Missin’ You”, “Jean Jacket”, “All My Friends”, “Change Your Mind”, “All Downhill From Here”, “All In”, “Wonder Years”, “When The Party Ends (Can’t Hardly Wait)” and “Wasted”. 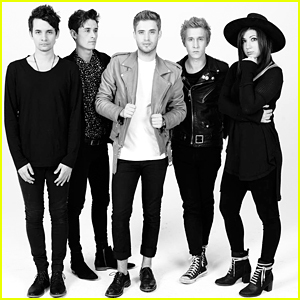 The Summer Set Debuts 'Missin' You' Behind The Scenes Vid on JJJ! The Summer Set loves us like mad you guys — they just sent us the behind-the-scenes vid for their music video “Missin’ You”! The band — John Gomez, Brian Dales, Jess Bowen, Stephen Gomez, and Josh Montgomery — unveiled the official video last month, ahead of their upcoming album, which is just weeks away from being released. “The song is not about actually missing someone,” drummer Jess explains in the video. “Contrary to that, it’s about getting over your ex. I think we’ve all been there before where you hit this point where you realize that you can live life without this other person. Check out the vid below! The Summer Set Drops 'Missin' You' Video Off Of Upcoming Album 'Stories For Monday' - Full Lyrics! John Gomez of The Summer Set dances in the fog with a mannequin in the band’s brand new video for “Missin’ You”. The band — John, Brian Dales, Jess Bowen, Stephen Gomez, , and Josh Montgomery — dropped the brand new vid late last night (February 18) while gearing up for their upcoming tour and album. “Missin’ You” is the second single off of Stories For Monday, which hits shelves and digital retailers on April 1st. In case you missed it, you can watch the vid for “Figure Me Out” and grab all of The Summer Set’s upcoming tour dates on JJJ! The Summer Set Announces Summer Tour Dates in USA & UK! We are freaking out! The Summer Set just announced their tour dates for this coming spring/summer and JJJ wants to go to each date! The band — Brian Dales, Jess Bowen, Stephen Gomez, John Gomez, and Josh Montgomery — dropped the dates over the weekend, after debuting a brand-new music video from their upcoming album, Stories For Monday. “It’s been 5 days and I’m still having a having a hard time catching my breath since we released ‘Figure Me Out’. I’m speechless. I guess when I wrote this song at my parents house I never imagined this response from fans, friends, strangers, and other musicians I love and respect. It feels so, so good to be back,” Brian shared. 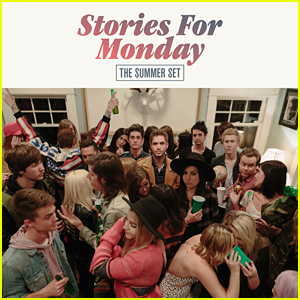 The Summer Set's New Album 'Stories For Monday' To Drop April 1st; Tour Announcement Coming! We are so ready for The Summer Set‘s new album, Stories For Monday, it’s not even funny. The band — Brian Dales, Jess Bowen, Stephen Gomez, John Gomez, and Josh Montgomery — are back with an all-new album on April 1st and JJJ can hardly wait. Stories For Monday is available now for pre-order. Be sure to watch The Summer Set‘s video for “Figure Me Out” on JJJ now! The Summer Set Is Back With An Awesome New Song 'Figure Me Out' - Watch Here! 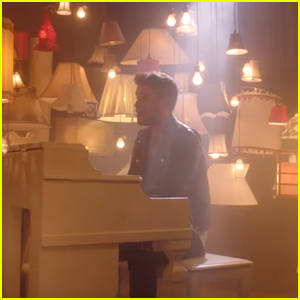 Brian Dales plays the piano in the brand new video for The Summer Set‘s brand new single and video, “Figure Me Out”. The group — Brian, Jess Bowen, Stephen Gomez, John Gomez, and Josh Montgomery — debuted the new song and video on social media tonight (January 21) after working on their new album, Stories For Monday, for over a year. Stories For Monday will drop on April 1st.